Check out the latest Add-ons for Studio One: Music City Drums’ Biscuits and Gravy! Biscuits and Gravy gives you raw and essential rhythms that can be applied in virtually any genre. The loops feature five drum setups consisting of both vintage and modern equipment, from Yahama to Rogers to obscure one-of-a-kind drums that you’ll only find in a true drum connoisseur’s collection. One setup features a lo-fi channel that is a mono sum of the kit sent out to a eurorack modular effect system to add some grit and character. Biscuits and Gravy was given its own unique sonic identity by utilizing varied configurations of myriad outboard gear, as well as by manipulating the drums themselves. Drums were paired with various methods of dampening, tunings, different heads, and in some cases even removing resonant heads to achieve the right sound for each kit. Meticulously recorded, delicately produced, and packed full of flavor in Nashville, Tennessee, these audio loops were specifically recorded with both character and attitude set to inspire and move you without the limitation of genres. Inside you’ll find a variety of grooves with that punch and feel you’ve been looking for. That makes it totally clear. Thanks! Biscuits and Gravy (non-extra version) has stereo mixed-down versions of the loops. Biscuits and Extra Gravy has multi-track versions that you get to mix yourself. Hope that helps! 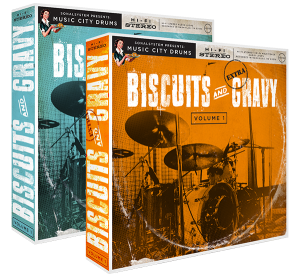 Why buy Music City Drums vol 1 – Complete Bundle which includes Biscuits and Gravy and Biscuits and Extra Gravy? Biscuits and Gravy includes over 450 production ready audio loops with 5 kits recorded. Biscuits and Extra Gravy includes over 3,600 production ready audio loops with 5 kits recorded plus a library of 35 pre-made songs in Studio One for you to tweak, chop, and remix to your heart’s content. Why buy the bundle? Are the 450+ loops in Biscuits and Gravy not included as part of the loops in the Extra version’s 3,600+? Are the kits different? It would seem buying Biscuits and Extra Gravy would give you everything, but if not, the sales page isn’t clear. Can someone please tell me what, if any advantage there is to buying the bundle? Thanks.